Welcome to Chez Keisha. We have some specials today. This post is sponsored by Only Natural Pet, and the BlogPaws Professional Pet Blogger Network. I am being compensated for helping spread the word about Only Natural Pet Feline PowerFood, but Stunning Keisha only shares information I feel is relevant to my readers. Only Natural Pet is not responsible for the content of this article. 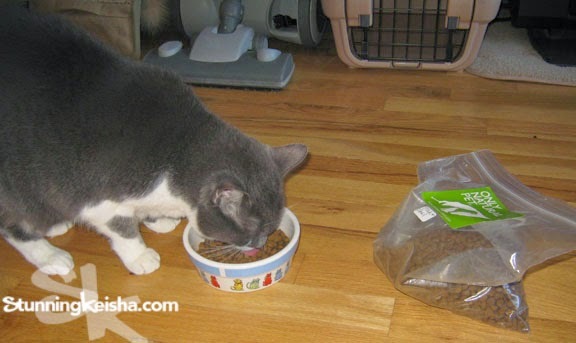 Back in the days when Nicky and Autumn were the bosses around here, grain-free, natural cat food was a new concept. Those cats called it “hippie food” and any attempt to introduce it into their diet was met with resistance and floor scraping. It’s a whole new ballgame with CK in charge. I deserve the best! 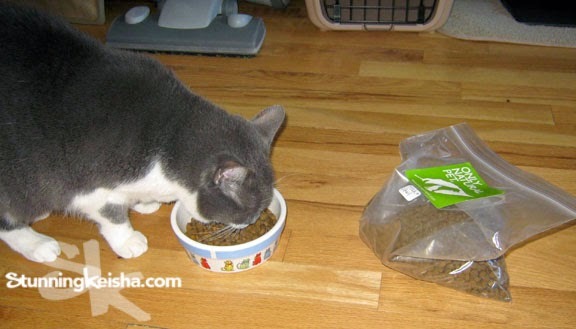 Supermarket cat food won’t do for this former ghetto kitteh turned internet sensation. Healthy cat food is the norm and Only Natural Pet® is leading the charge. Lemme whet your appetite for Only Natural Pet Feline PowerFood™ Dry and Wet Cat Food. The Feline PowerFood™ was formulated by a holistic vet and is packed with protein (76% animal-based ingredients), amino acids and essential fatty acids. It’s infused with a proprietary PowerBoost™, a raw, freeze-dried blend of superfoods like green lipped mussels, sea cucumbers, probiotics and pumpkin. Yum, I love pumpkin! Plus it’s made in the USA and contains Menhaden Fish Meal, an allergy friendly, high protein fish so cats with allergies can eat it safely! 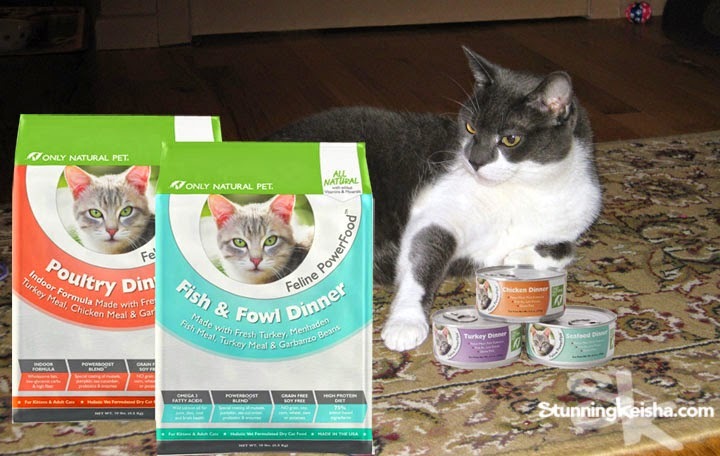 They make flavors for any discerning cat palate no matter if your cat likes fish or fowl. Kibble is available in Fish & Fowl Dinner and Poultry Dinner. Being I’m a known pescetarian, I got the fish flavor to try. Let’s get right to the point. Did The Cat try it? Did The Cat like it? Pop, like most men, isn’t the most observant so when he remarked to TW last night how much I love that “new food,” we both took notice. That “new food” is so new they didn’t even have the packaging when they sent it to me. You can pre-order your food now so that you can be one of the first to receive it when it becomes available to the public in May. Pre-order it exclusively on www.onlynaturalpet.com, www.pet360.com, and www.petfooddirect.com. In the meantime, you can watch me sampling the food. TW finally decided to start the video when I was almost finished eating. If you’re like TW and would rather your cat eat wet food, there’s Only Natural Pet PowerPâté™ Canned Cat Food. You can choose from Chicken Dinner, Turkey Dinner or Seafood Dinner. You can find Only Natural Pet online on Facebook, Twitter, Pinterest, Google+ and YouTube if you have any questions for them or want to find out more about their PowerFood. Can you see my little pink tongue? I would love to try the canned version of that! Sounds great CK and enjoy. Have a wonderful Wednesday. That sure looks scrummy and is obviously going down a treat. I don't know if it will make its way over here but we'll look out for it. Sounds like great food! And how cool you got to try it before it's available for purchase! The Farm cats were all in favor of the kibble and Pumpkin WOULD NOT SHARE the turkey wet food. It got a little ugly around here regarding the turkey. So glad you liked it too! We really liked the kibble. We've only tried one of the wet food varieties and are okay with it. Great review! We would love to try some of this yummy healthy food! oh and thanks for liking the story of Katie Too as told on Cat Wisdom this month! 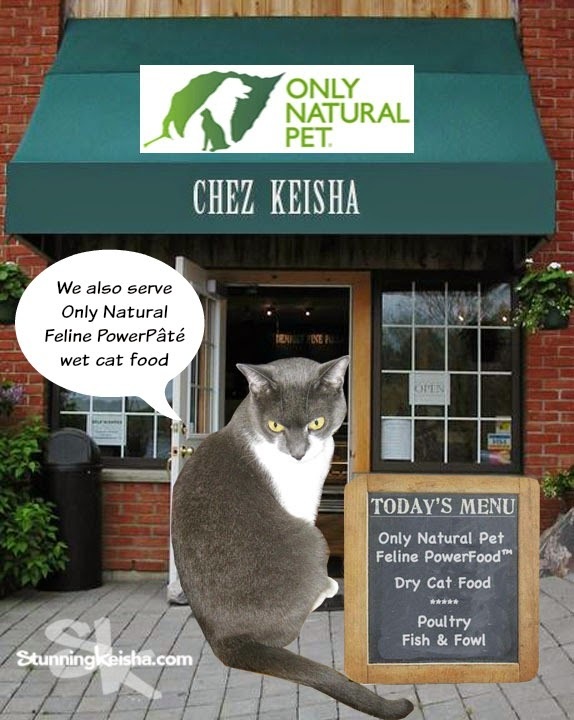 We would definitely enjoy dining at Chez Keisha :) Reservations for 2 please! You sure were enjoying that yum CK! That does look yummy CK! Great review- looks like a good food. You truly do deserve only the best. We loved this food too! That looks very tasty. I usually only eat wet food but since I have been ill I don't want to eat. I have started to eat some dry food now, but still don't want the wet any more. This sounds like great stuff! Wes gets both wet and dry foods this looks like one to try! That sounds really good. We'll have to try the canned version. I told the Human to check out the food, but I cannot emphasize strongly enough how EXCITING it was to see you eating. I LOVED watching you! You are even more beauteous than usual when I can see you moving around. Grrrrrrrrrrrrrrrrrrrrrrrrr. Hubba-hubba! Excellent review CK! I am trying to decide if Callie is a fish or poultry lover. I'm leaning more towards fish, but she does seem to like both as far as I can tell. Love your video - looks like you enjoy the food! Interesting. Perhaps we should try it out! I came back to watch the little moobie again. Could you make another one soon?